Keep current on all the latest news and events happening in our community! Check out our list of upcoming events and volunteer opportunities to see how you can get involved. 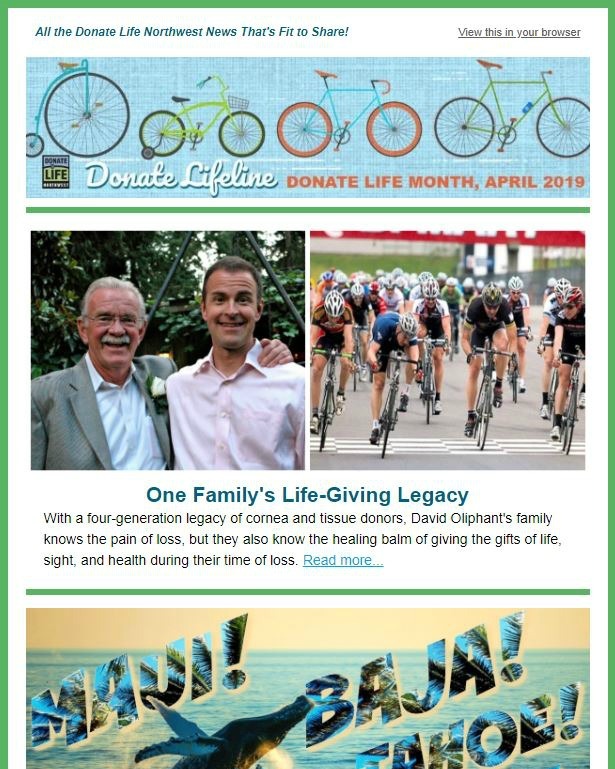 Stay in the know and sign up for our monthly eNewsletter, The Donate Lifeline. Click here to Subscribe! To see the current or past issues of our eNewsletter click here. For about 30 years, Liz Campbell has owned the toy store 'Kids at Heart' on SE Hawthorne in Portland. In her line of work, she's usually the one supplying the presents -- but when she needed a kidney transplant last year, it was one of her customers, Emily Lighthipe, who gave her the gift of life. Chrystee Houser is hoping for a second miracle. Fifteen years ago, Houser’s son Rhyson was just 10 months old when his failing liver was replaced with a healthy one from a donor. Now, that liver is failing, and Rhyson and his family are hoping for another. Surgeons turned down Terra Goudge for the liver transplant that was her only shot at surviving a rare cancer. Her tumor was too advanced, they said -- even though Goudge had a friend ready to be her living donor. But then, she found a hospital on the other side of the country that let the pair try.